The Phosbat (コカガミ?, lit. : "Child Mirror") is a creature found in Pikmin 3, and is the infant form of the Vehemoth Phosbat. It bears some notable resemblances to the adult form, including its orange wings, black, hairy head, and big bulging eyes that squint when exposed to light. The noises the Phosbat emits is also similar to that of the adult form. Its legs are stumpy, similar to those of the adult, but it lacks proper arms. It also lacks fluorescent lights upon its head, and only two fangs are visible in its mouth. Phosbats can only live in dark environments, such as caves, and will take continuous damage as long as they are exposed to light. Therefore, they can easily be dealt with by throwing Pikmin at Common Glowcaps found in the caves where they grow. This will cause them to spring up and become a light source, scattering and damaging, potentially killing, all nearby Phosbats. Phosbats are first found by Charlie in the Distant Tundra, being the first enemy to be seen in the game, and are later encountered again by Alph and Brittany, during the fight with the Vehemoth Phosbat, where they are spawned by Phosbat Pods. The pods are only activated after two of the smaller lights have been turned on, so it is possible, and preferable, to not encounter the Phosbats during this battle. After the boss is defeated, the pods close up and Phosbats are not encountered for the remainder of the game. A group of 16 Phosbats can be found in Battle enemies! mode for Beastly Caverns, directly under Alph's starting position. Despite being in such a large number, they are easy to defeat right at the beginning, as 10 Rock Pikmin are found in the area, as well as many Glowcaps. Each Phosbat killed provides 5 points, making a total of 80 points for killing them, accounting for close to 20% of the score for completing the challenge. Phosbats are found in dark or dimly-lit areas and only pose any threat if the player comes very close to one. They tend to wander around in circles, not moving anywhere, and they will give a short and slow chase if they spot a leader or Pikmin with their limited range of sight. Their bites pose little threat to leaders, unlike the Bulborb Larva, and they die very quickly. Phosbats are always found in groups, and Glowcaps are always nearby. Therefore, the quickest way to defeat them is by touching the caps with either a leader or a Pikmin, thus casting light over an area, damaging all Phosbats in the radius. 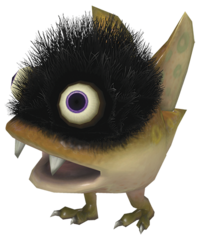 If some are left alive, and chances are that a few will, then any type of Pikmin can be thrown at the creature's back to defeat it, similar to a Dwarf Bulborb. Phosbats don't attack very often, and the area that they can cover with one bite is minimal. This makes them easy to defeat without any Pikmin deaths. If a Pikmin is caught, there is a good amount of time before the creature will swallow it, providing the opportunity to kill it with lights or another Pikmin. Phosbat Pods (コカガミのタマゴ?, lit. : "Child Mirror Egg") are nest-like structures from which Phosbats spawn. If light from a Glowcap shines on top of one, it closes its opening, preventing it from spawning more Phosbats. If a Phosbat Pod doesn't activate before the big light bulb in the Vehemoth Phosbat arena is turned on, it will remain small. "Phosbat" is a combination of two terms. In Greek, φῶς ("phos") means "light". This refers to how the Phosbat has the ability to bend light and turn invisible, at least in the adult stage, and also how it cannot withstand bright lights. "Bat" refers to how it looks and acts similar to real-life bats. In Japan, it is known as コカガミ?, which means "Child Mirror", given that it is an infant, and how the mature creature can bend light, a bit like mirrors. The enemy's internal name, kokagami, matches the Japanese name. Close up of some Phosbats. A close up of a blinded Phosbat. Phosbats ducking to prevent being eaten by the Vehemoth Phosbat. An inactive Phosbat Pod on a wall. An inactive Phosbat Pod on the ground. A Phosbat Pod releasing a Phosbat. Light making a Phosbat Pod close its opening. When Phosbats die, their eyes pop out of their heads and roll on the floor. Phosbats resemble their adult variation. Therefore, they are not considered larvae, but are rather nymphs. The Phosbats in the opening sequence can kill Pikmin. However, they will not be counted as Pikmin casualties for the in-game reports. 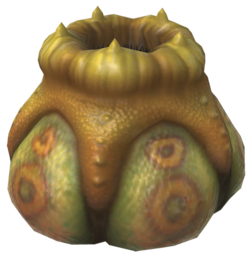 The particle effects that come out of dying Phosbat and Phosbat Pods, Pods spawning Phosbats, and Pikmin dusted by the Vehemoth Phosbat are all the same. It is actually possible for Phosbats to still be alive after the boss is defeated by not turning the big light on. To do this, the player has to defeat the Vehemoth Phosbat by continuously throwing Pikmin at it until it dies. This page was last edited on January 15, 2019, at 02:44.